1. Boil the potatoes according to the pack instructions. Remove with a slotted spoon. Cut into halves or quarters roughly the same size. Set aside. 2. Bring the water back to the boil. Blanch the asparagus in the boiling water for 30 seconds. Remove with a slotted spoon, refresh under cold water and cut in half lengthways. 3. Whisk together the mayonnaise, soured cream and garlic. Season. Mix in the warm potatoes until evenly coated. Add two-thirds of the salad onions, celery, nigella seeds and asparagus, and mix again. 4. 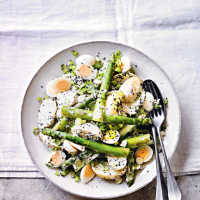 Scatter over the remaining salad onions, celery, nigella seeds, asparagus and the quail’s eggs, and serve at room temperature.